Are you known for your love of cats? 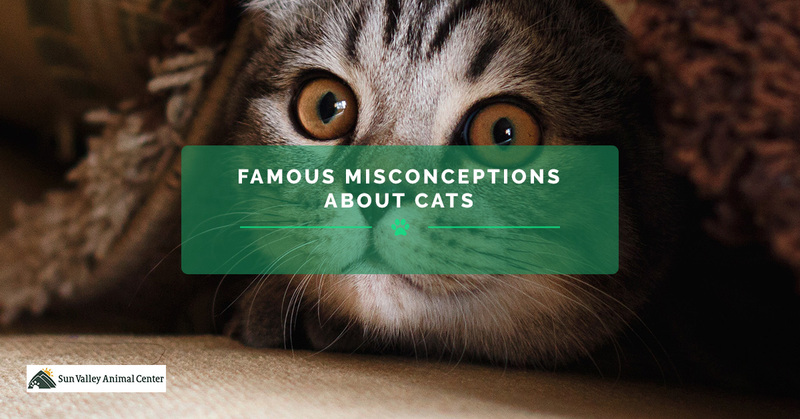 Then you won’t mind reading a bit about your feline friend and debunking some of the popular myths those weird, non-cat people believe. If you’re searching for a new veterinarian to enhance your pet care regimen for you adorable buddy, then look to Sun Valley Animal Center here in Ketchum. We’d be delighted to see you and your adorable kitty. We know it’s hard to say no to your fuzzy lil Mr.Meowkins, but just because he’s whining does not mean you have to give him something. Especially if that thing he’s demanding is milk. This substance is widely debated for humans. However, the major issue with cats ingesting milk is that after they are no longer kittens, they lose all the enzymes in their digestive tract that can break down those kinds of fats. Essentially, your cat is lactose intolerant when they’re grown. This can come in the form of fishy, milky farts that will probably be in your face at night while your kitty is snuggling you. So be strong and avoid kitty gas by saying no to sharing your dairy beverage. For some reason, this is a common misconception. The average cat is at least twice as smart as a dog. This is due to several different factors. The brains of cats are much more complex than that of dogs. Where dogs ring in at 160 million neurons in their cerebral cortex, the cat has 300 million neurons in the same place. This portion of the brain, in both animals and humans, controls the processing of cognitive information. Cat’s brains also are 90% identical to a human brain, which is mainly displayed in the similarities within the section of the brain that controls emotions. Their overall intelligence is pointed to by their much larger capacity for long-term memory, which is heightened by doing rather than seeing a rick of behavior displayed. It must be conceded that dogs have a higher social IQ, but can solve higher-level cognitive issues than dogs can. Have you ever seen a particularly chubby lil kitty try and fit through something they’re too wide for? That’s because they’re sensing the width of this space with their whiskers. They’re made of keratin which is the same material you’ll find in horns on other animals. In relation to balance, the only thing they’ll be able to do is sense their body’s proximity to the ground, and potentially if there’s a shop drop off. This little strands of keratin are attached to nerve points in your cat’s face. They allow them to sense how the air moves around objects, like your couch, and therefore notifies them of an obstacle. They assume that their whiskers are the same width as their body, so when they use them to feel out if they can fit through that tiny space, they assume they can because they don’t realize their pudgy body is gonna get stuck. If your feline is in need of a checkup or a great place to vacation while you’re out of the house traveling the world, then Sun Valley Animal Center is your one-stop shop. With a wonderful staff and experienced pet care services, we’re proud to offer top of the line services to you and your pet. Contact us today.